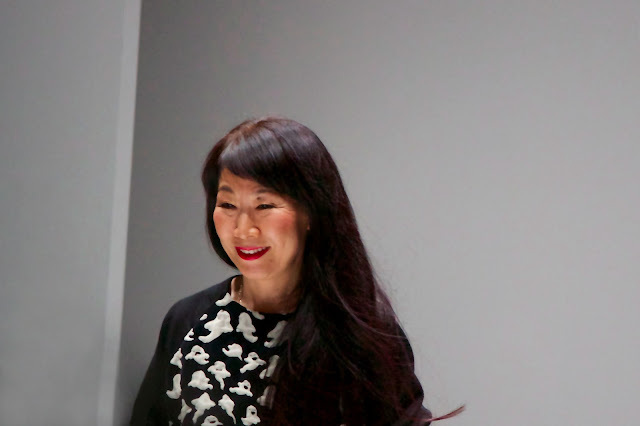 On Friday night Singapore Audi Fashion Festival showcased leading Japanese designer Tsumori Chisato to a packed house. This innovative designer shows on the runway in Paris and has gathered quite the cult following including stylish London blogger Susie Bubble. Having worked with Japanese greats like Issey Miyake, Tsumori decided to launch her own label in 1990 and then took her work to Paris in 2003. Tsumori's signature style of luxurious textures, intricate beading, embroidery, appliques and unique prints has been celebrated all over the world. Graceful, elegant and fun her fabulous designs have stolen my heart. Any designer who can make a lobster look like it belongs on Grace Kelly has my full support! I really like the style especially the bright and contrasting colours and textures. The Japaneese know how to do it. Love the style. My favourite is the blue Jacket and pants outfit. Does she sell in Australia? What - Singapore has a fashion festival ... who would think? Fashion and holiday .. a great combo! !